This is the obituary written by her daughter Shalva, and printed in the Jerusalem Post. 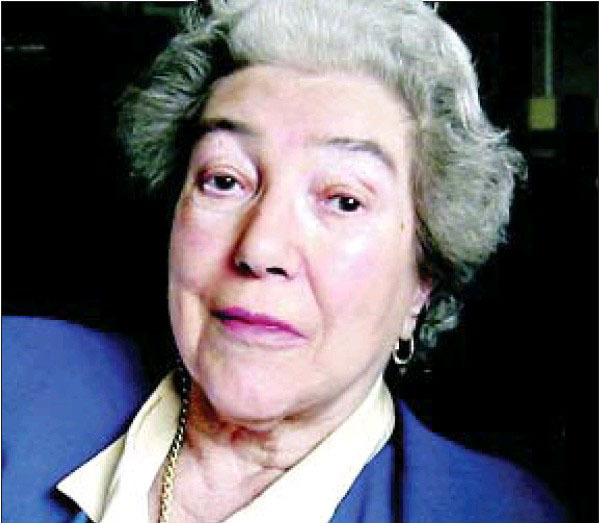 Known as a model educational leader Phyllis Dimson (1917 - 2011) , likely one of the most educated Jewish women of her generation headed london's Hasmonean Girl's School and revolutionized it from a parochial Jewish institution to a competitive serious grammar school. If anyone beyond the age of 50 or so were asked to name the most respected women in Anglo Jewry, they might mention Phyllis Dimson, former headmistress of the Hasmonean Girls' School. Known as a model educational leader, she was admired and revered by many, including the extremely religious, and she succeeded in retaining an excellent name as a true professional in the community at large. Phyllis Frumet Dimson was born in Manchester in 1917 and died on August 3 of this year. Her mother, Bertha, was four years old when she came to England from Bialystok. Bertha married Gedalia Heilpern, who had come as a baby from Brod in Poland (later Austria) to Manchester. Sadly Heilpern died in his 30s, and the widow Bertha was left to raise three children: Phyllis, Eileen and Goff. This she did with help from her six brothers, three of whom were doctors, and two sisters. Phyllis was sent to live with her maternal grandparents, who had by now settled in Leeds. In Leeds, she obtained a rare scholarship for a Jewish girl, to attend the prestigious Chapel Allerton Girls' High School. However, when she was a teenager, her grandmother died and she had to leave. She moved to Bradford to live with her uncle, Dr. Jack Reuben, and aunt. When Phyllis became critically ill, she transferred to her mother's house in Sunderland, where another medical uncle tended her. There, she attended the sixth form (equivalent to 12th grade) of the academically selective Bede Grammar School, and went on to study for a BA and an MA in French at Durham University. Her thesis was on Old Proven?al French. She was likely one of the most educated Jewish women of her generation. During her studies in the 1930s, she lived with Madame Goldberg-Herzog, the sister of Chief Rabbi Isaac Halevi Herzog and a close family friend. At the Sorbonne she encountered Polish Jews who did not observe kashrut but labeled her a "non-Jew" because she did not know Yiddish. Not to be beaten, she learned Yiddish as a foreign language. She returned to England at the outbreak of World War II. In 1942, she was recruited by the WAAF to parachute into occupied France, since she was bilingual in French. She agreed, but in a later interview was asked where her father was born. She said he had come as a baby from Austria, whereupon the recruiter screamed, "Enemy alien, enemy alien!" She therefore never parachuted into France, but was spared a terrible fate. A film entitled Female Agents was made about this story in 2008; all five women who were recruited were shot down, arrested and executed. She Spent the war years keeping up morale in the local Sunderland Jewish community, sorely depleted because of conscription. She used to walk on Shabbat for an hour and a half to the girls' hostel to work as a youth leader among the Kindertransport children. Charismatic and a fervent Zionist, she enthused about the Zionist cause. In 1942, the Sunderland Jewish Community Bulletin for the Forces, initiated by Rabbi S. Toperoff, the local minister, contained a message from Phyllis Heilpern reporting on the activities of local youth group Habonim and the Young Zionist Association. In 1944, Rabbi Solomon Schonfeld, having heard about this young woman,visited Sunderland and refused to leave town unless she took up his offer of the senior mistress post in the newly founded (then-coed) Hasmonean Grammar School. She was unsure whether she wanted to leave her family, but in the end she did: The Bulletin for the Forces reported that "Phyllis Heilpern will be missed as she was the inspiration of Habonim and Habonot. She sacrificed her leisure for the Zionist cause and as chairman of the SYZA (Sunderland Young Zionist Association) for a number of years she helped to build a strong and informative Zionist Youth." As soon as she arrived in London, she became part of the Jewish social scene. Attending a PATWA (Professional and Technical Workers' Aliya) meeting, she heard a lecture by a bachelor speaking fluent Hebrew and boasting of his exploits in Palestine. Afterward, the young man, David Dimson, asked to be introduced to her. The two were married on March 20, 1946, and remained married for 63 years until David died 18 months ago, on February 3, 2010. While David ran Dimson's wine shop in Cricklewood, Phyllis worked as a French teacher at the Hasmonean Boys' School. In 1961, Schonfeld asked Dimson to become headmistress of the Hasmonean Grammar School for Girls, a challenge she accepted. In the decade that she headed the school, she revolutionized it, changing it from a parochial Jewish institution to a competitive and serious academic high school. Within two years, she had submitted her first pupil as a candidate for Oxford University, overcoming religious objections and diplomatically handling her somewhat conservative Board of Governors. She was supported throughout by Schonfeld. There were few committed English Jews from the previous generation who did not know of the remarkable achievements of "Mrs. Dimson." She was legendary as a headmistress, distant in her black gown and mortarboard, yet professional and kind.